Sharm el-Sheikh is a renowned port and resort town in the southern Sinai Peninsula in Egypt, at the mouth of the Red Sea. 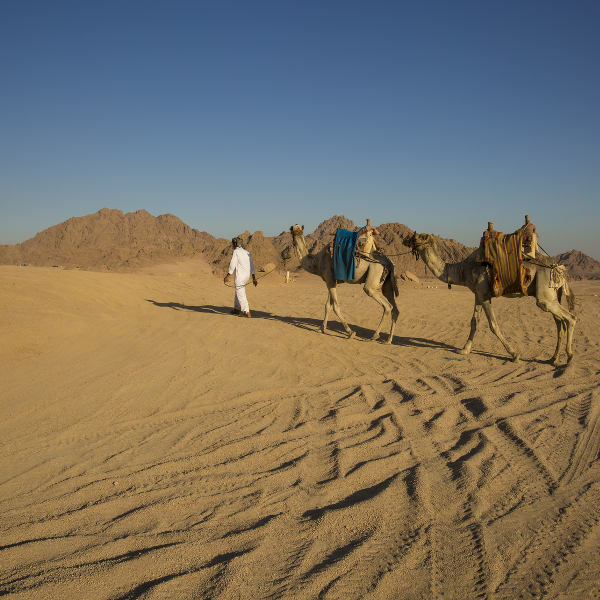 As a prominent location for local and international tourists, the city boasts a plethora of adventures, including camel trekking in the Sinai, sprawling beaches and some of the best diving spots in the Middle East. Cheap flights to Sharm el-Sheikh are now available for a limited time only, so book your flight today and be enthralled by the enchanting landscapes and island attractions of this inviting, coastal city! Sharm el-Sheik is home to Sharm el-Sheikh International Airport (SSH), a 10-minute drive from the city centre. 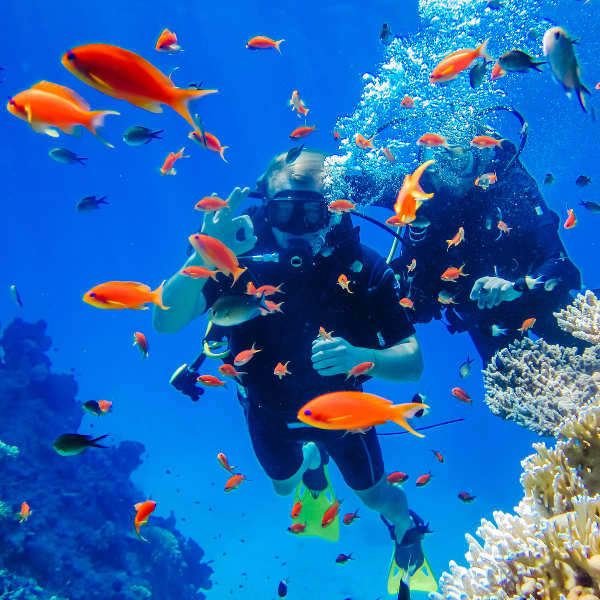 When you’ve had your fill of lazing on the sun-kissed beaches, grab your fins and head to Tiran Island or Ras Mohamed National Park – the 2 best diving spots in the Red Sea, brimming with exotic marine life! Discover local customs and charms in the Old Town, bustling with street markets and local eateries. SOHO Square lights up with its Musical Fountain and colourful art displays. 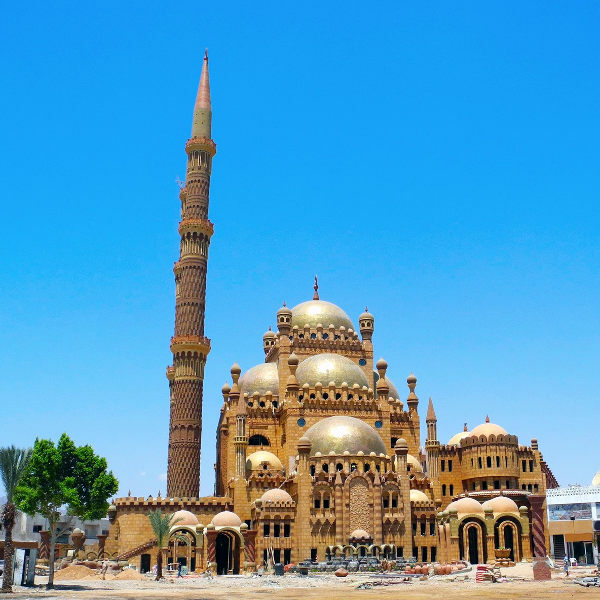 The Coptic Church and Al Mustafa Mosque are architectural masterpieces. Discover the incredible landscapes by 4X4, horse or camel and trek through the canyons and Bedouin villages in the Sinai Desert. Adventure-lovers can parasail and quad-bike along the dunes, before camping under the stars for an unforgettable experience. Sharm el-Sheikh experiences a desert climate, but its location on the coast results in a pleasant climate all year round. With little to no rainfall and sunshine throughout the year, any time is perfect for visiting this stunning seaside retreat! Skip the crowds and high rates between June and August when European holiday-makers hit the beaches in peak summer season. Rather go in April/ May or September/ October to bask in the warm sun and enjoy coastal activities at half the price! Should you find yourself in the city during the Muslim celebration of Eid, you can be sure to find lots of festivities down at SOHO Square, where restaurants and bars are bustling till all hours. Sharm el-Sheikh, affectionately referred to as ‘Sharm’, is a popular Egyptian holiday resort town at the southern tip of the Sinai Peninsula. Romantically referred to as the “City of Peace”, the region’s beaches boast some of the best diving spots in the Middle East. Once a fishing village, this city is now a modern, developed metropolis featuring a lively nightlife, high-end hotels and golf courses, and a sprawling shoreline with sandy beaches and exotic marine life. Scuba diving and snorkelling are a major drawcard to the city. Dive into the Red Sea and discover the colourful reefs and shipwrecks at Tiran Island and Ras Mohammed National Park. A tour of the desert is a must. Explore the areas of the Bedouins, the Coloured Canyon and Mount Sinai with exquisite views of golden sands and rock formations. For the adventurous traveller, hire a private guide and spend a few days riding a camel through the desert’s hidden valleys. The sights and sounds of the city’s charm and festivities make for an electric atmosphere. Tuck into some local cuisine while watching a display of belly-dancing. Egyptian cuisine encompasses many flavours and influencers - popular local dishes include kushari and fresh guava juice. Don’t leave without bartering down some luxurious Egyptian cotton and hand-made souvenirs! Compare several airlines, and book your cheap flights to Sharm el-Sheikh online at Travelstart! Sharm el-Sheik is considered to be a very safe city. As in any foreign city, exercise common sense and vigilance with personal belongings. During peak season, the market place often attracts pick-pockets, so keep your valuables close and don’t flash expensive jewellery or equipment. Single females are not advised to walk the city streets at night – rather take a taxi for peace of mind. There are no mandatory vaccinations required to enter Egypt, but Typhoid and Hepatitis A shots are recommended due to possible contact with contaminated food and water. Avoid raw foods, particularly during in the summer heat, as food hygiene may not be up to standard. Tap water is fine for showering, but stick to bottled water for drinking. Pharmacies do stock generic medication, but you may need to haggle the price. Consider taking out comprehensive travel insurance.